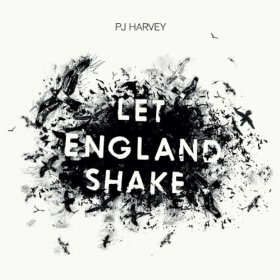 Let England Shake, PJ Harvey’s 10th studio album, has the same stark quality she is known for, but it sounds as if it has been run through with a fine tooth comb, only leaving the true essence of her sound. The title track compares a warring England to a phoenix rising from the ashes, with the words “Weighted down with silent dead / I fear our blood won’t rise again.” The following track (and perhaps the album’s best), “The Last Living Rose,” is an up-tempo romp through “dead sea captains,” “stinking alleys,” and “drunken beatings,” while the song “The Words That Maketh Murder” is written from the viewpoint of a solider at war. Harvey’s voice vibrates on every track, each word escaping her lips like smoke unfurling into the air. Her collaborators John Parish and Mick Harvey add vocals that mix well with hers rather than covering up her voice. She tackles dark and weighty topics such as war, death, and loss with simplicity and grace. For a somber album, Let England Shake manages to be full of catchy songs and finely crafted stories.